Don't know what everyone is complaining about. It's not a pub , it's a restaurant. The food isn't great. It's ok though and it's cheap. Three times i've been served an utterly undrinkable pint there, although the staff are polite and give a refund or offer me something else. Pity as its such a nice location. Don't bother with the place anymore - me and my GF take a couple of bottles and sit down on the golf course by the 9th tee if its warm enough - very nice in the summer. Awful, truly awful. Zero atmosphere. Poor choice of drinks. Stroppy waitresses and bar staff. A terrible place to come at the end of a great wlk. The Derby Arms down the road is much better and you can get a nice view of London. A good place for a quick cheap-ish drink but dont waste your money on the food here. Almost all the food is cooked from frozen - pretty much everything bar the salads! The place is severely understaffed! Resulting in food orders taking over 30mins just for a staqrter and then another 45mins ontop for mains, rediculous! Nice to sit outside in the summer but come evening time the place really has nothing to offer. Food portions are tiny and clearly sit out under the lamps for ages drying up - dont try and ask for a few more chips to add to your stingy '7 chips only' portion as you'll be replied to with a blunt 'chef says no'. Staff are cold and unfriendly, including the managers. Dont expect to see a smile in this place! As has been said, great location and I�m afraid that�s about it. Drinks quality was ok, but had to wait in a queue 5 deep at the bar with one person serving on a busy (as they should have anticipated really) sunny Sat afternoon. Plenty of staff on but none of them really doing anything, oh one girl was cleaning the bar but not serving the now 10 strong queue of potential customers. In the garden tables were covered in empties, on of our group even suggested at the bar that someone actually clear them up, we watched one lonely group of empty glasses sit there for over 2 hours! Ordered their starter for two, best part of about �8 if memory serves me well, was ok in quality, but only ok, nothing special, and the portion size really wasn't for two. 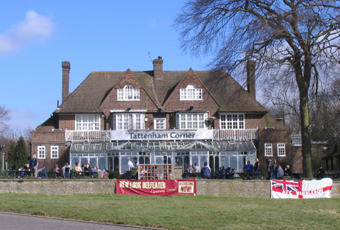 Oh and to my surprise if you've been up on the downs walking your dogs as prob thousands do every weekend, don't take your dogs to this pub as they're not allowed in, not even in the garden that lends itself perfectly to walkers and dog walkers alike, very strange decision to ban dogs in my opinion. Would go back to get a second opinion and see if they were just having a bad day, suspect not though.